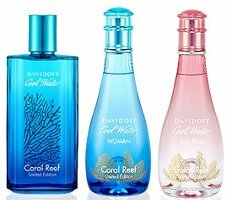 Davidoff will launch Cool Water Coral Reef, the brand's 2014 limited edition summer flankers for the Cool Water fragrance series, in March. As with the last two sets of summer flankers, the sales will benefit the National Geographic Society's "Pristine Seas" program to protect the oceans. Other upcoming Davidoff fragrances include Cool Water Night Dive. Cool Water Man Coral Reef Edition ~ a flanker to 1988's Cool Water, with mandarin, mint and sandalwood. In 125 ml Eau de Toilette. Cool Water Woman Coral Reef Edition ~ a flanker to 1996's Cool Water Woman, with melon, lily of the valley and iris. In 100 ml Eau de Toilette. Cool Water Sea Rose Coral Reef Edition ~ a flanker to 2013's Cool Water Sea Rose, with mandarin, rose and cashmeran. In 100 ml Eau de Toilette.